The unfinished side edges of Angela’s mosaic look particularly neat because the sides of the ceramic tile is straight and not beveled like the sides of vitreous glass mosaic tile, which could still be used if you didn’t mind an edge that was a little rougher. TIP: Angela made sure to mask off the edges using painter’s tape to keep the grout from getting on the sides of the frame. If you wanted to use glass tile but prefer flat (non-beveled) sides, the 12mm Morjo Recycled Glass is recommended, but the 8mm Morjo might be better for very small frames or if you needed to draw or spell anything but want to avoid cutting. You can mosaic the side edges of your frame, but if you do, it will look better if you mosaic the side edges first and have the tiles on the face of the frame extend out a little bit. Make sure you glue tiles to bare wood and not painted or varnished wood. 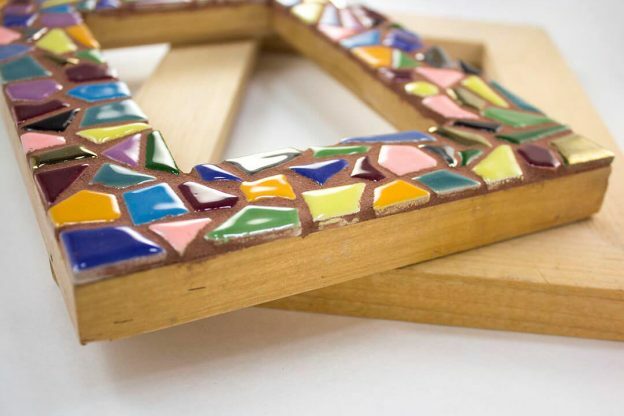 Angela started with an unfinished wood frame, and sealed it with Weldbond PVA glue. The white PVA adhesives used for glass tile do not bond to most paints and varnishes. Neither does grout. If you have an old painted frame you would like to use, you might be able to expose enough wood by scuffing with coarse 80-grit sandpaper. If sanding, be careful not to fatigue the corners of the frame. If you do make your frame wobbly, don’t panic. You should be able to repair it with Weldbond mosaic adhesive, which bonds to wood even better than it does to glass. Mosaic Picture Frame made by Angela. 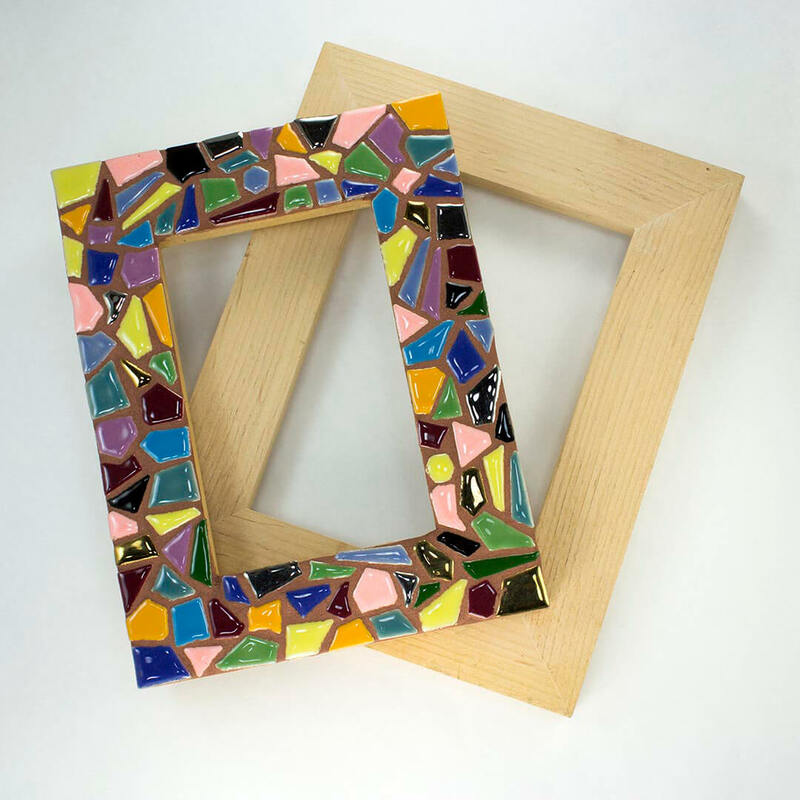 Unfinished wooden frames can be purchased online from eBay, Amazon, and the usual suspects. This entry was posted in Improving Your Art, Material and Tool Information and tagged contemporary mosaic, fun project on December 26, 2017 by Joe Moorman.